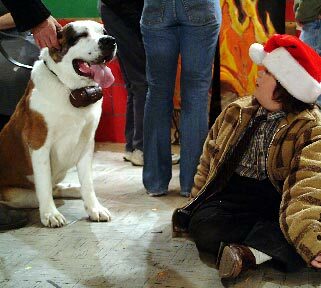 "THE 12 DOGS OF CHRISTMAS"
When 15-year-old Emma Kragen came up with the story of "The 12 Dogs of Christmas" at age 7, an idea originally written on the back of a restaurant place mat, she had no idea that her story would became a book published by Tommy Nelson Inc. and sell close to half a million copies. Now, at age 15, Emma's tale has new "legs" via a movie starring a cast of very accomplished actors to be released in time for Christmas 2005. 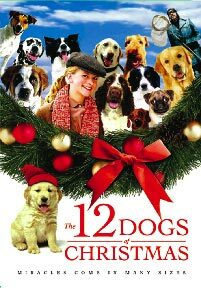 "The 12 Dogs of Christmas" DVD will be available in stores November 1st. It is being distributed by Screen Media in all US and Canadian markets except Wal*Mart stores which are handled thru Anderson Merchandising of Amarillo, Texas. Porchlight Entertainment is distributing the film overseas. Included in cast is Mindy Sterling, famous for her role in the Austin Powers trilogy, John Billingsley ("Star Trek: Enterprise"), Bonita Friedericy ("Christmas With The Kranks"), Adam Hicks ("Down & Derby"), Jim Jackman ("Chopping Block"), Eric Lutes ("Caroline In The City"), Richard Riehle ("Bethoven's 5th"), Susan Wood ("Excessive Force") and introduces Jordan-Claire Green ("School Of Rock"). The movie was written and directed by Academy Award winner Kieth Merrill, and produced by Ken Kragen, Daenen Merrill, and "Napoleon Dynamite" producer, Sean Covel. The live action film, shot last year in Bethel, Maine, tells the story of a 12-year-old girl during the depression of the 1930's, who is sent to live with her aunt in a small town where dogs are banned. She joins the people and pooches of the town in a war with the Mayor and town dog-catcher, and through plot twists and adventurous chases, succeeds in bringing everyone together through a spectacular finale that involved more than 100 dogs and almost as many children to make.